Tik Tak tail is a fun filled and action-packed entertainer about a cute rabbit and ferocious tiger who are constantly on the run. it essentially tells s story of unending attempts of a tiger catch a rabbit and how the rabbit always outruns the tiger with his speed and smartness. But here is the twist in the tail... literally! Tik is not only battling Tak but also his tail. Tail has two roving eyes and hungry mouth of its own. But without hands and legs, he is at Tak's beck and call. However, If tail ever decides to have his way, he can simply wrap himself around a tree-trunk and not let Tak move ahead. 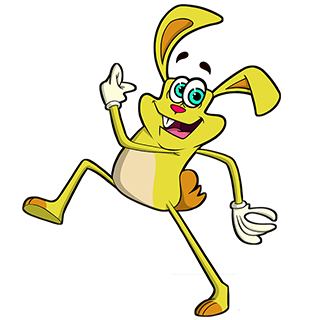 Tik the cute and colourful rabbit, has speed up his sleeve when it comes to, both, his actions and his thoughts. He runs fast and thinks faster. No wonder he always keeps Tak, the tiger, on his toes - almost literally. Whenever in grave danger, he goes únderground'by digging a burrow and pops out from somewhere almost unexpected. 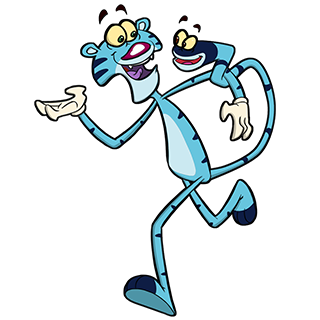 Tak, the tiger is always on the hunt for Tik. He can run as fast as Tik but cannot think as quickly. He often tries to scare the rabbit with his sharp Wolverine-style claws. But when the ferocious tiger ends up in a life-death threatening situation, the wild cat simply `meows`. Tak's armory compromises of his tiger strips that he is able to pull out from his body and shape into customized weapons to attack Tik. With his undying hunger for Tik, the tiger, undoubtedly, is a thorough non-vegetarian. Tail is the tiger's only companion. But in complete contrast with the tiger, Tail is purely vegetarian. 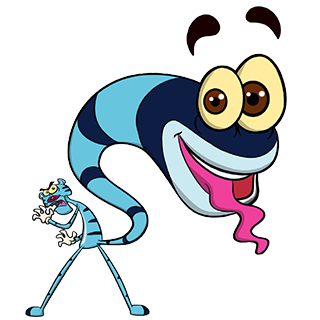 With a hungry mouth and two roving eyes of its own, Tail is a character in itself. While Tak is in hunt for Tik, Tail is always in search of Carrots, which he rabbit often has in abundance. So while their needs are different, their target remains the same.